It’s not how an interviewer acts. Rather, it’s how you react to that behavior which makes a difference. 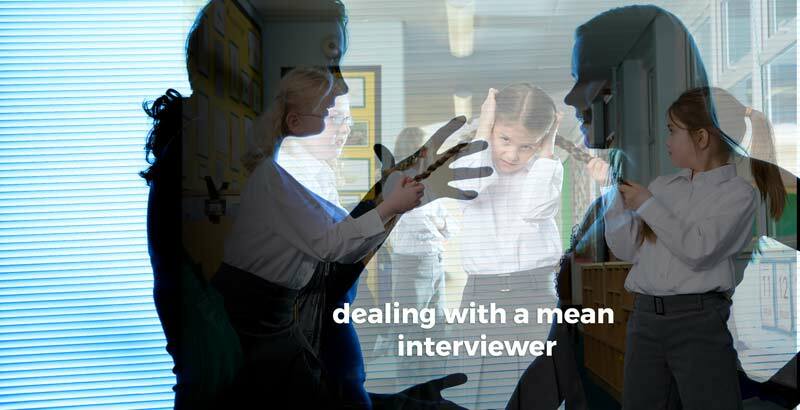 Many, job seekers mistake tough, candid, distant, quiet or blunt interviewers as unfriendly, intimidating or both. That’s when the interview begins to unfold. Regardless of age or career, the majority of job seekers have immense trouble interviewing with an abrasive recruitment or HR professional. These symptoms culminate into a poor experience for any job seeker. Though, the outcome can be different. Simply because an recruitment professional or hiring manager is not friendly, does not mean that you have to lose the open job opportunity. In the above career video, our sales and marketing recruiters provide advice on how to handle this type of interviewer and make the meeting advantageous to your career. Never take the actions or demeanor of the hiring manager personally. If you have never met or spoken with the person before, 99.9% of the time, that is their default interviewing persona. Be polite. Regardless of the interviewer’s demeanor, it’s imperative to remain polite, professional and poised. Those three characteristics have never gotten an interviewee into trouble. Keep your eye on the end prize. Remember, you are interviewing to obtain a job to further your career. You are not interviewing to find a best friend. Remain focused on solely what the interviewer is saying, not how they are acting. You don’t control a hiring manager or executive recruiter‘s actions. However, you do control how you react to that behavior. Keep your cool, remaining focused and put ego aside. Ultimately, you determine whether you get the job and move your career forward or get caught up trying to read an interviewer’s mind. The latter never works well.